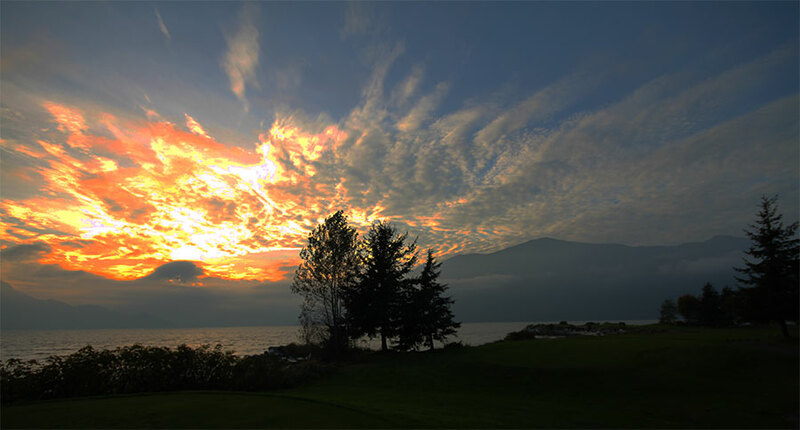 A day off in one of our favourite cities in the world has to be a day to relish, so I did my utmost to arrange some golf knowing full well that there are some beautiful courses in British Columbia. 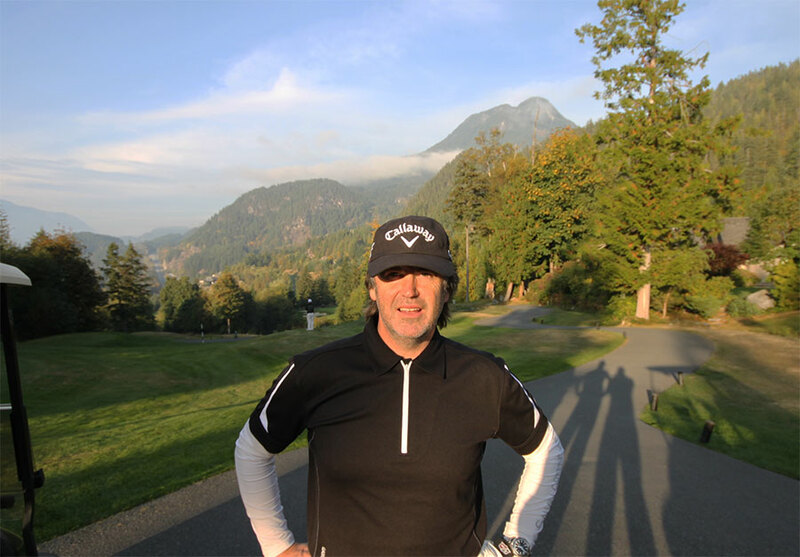 With the kind assistance of local forumite and golfer Gordon Magnusson, we were able to secure an afternoon tee time at Furry Creek, regarded as the most scenic course in BC. It was touch and go as to whether my golfing compatriots Glenn and TC would make it as their bus journey overnight from Calgary had its unknown elements. Luckily, they rolled into town at 11:30am and were ready to get going an hour later. Furry Creek didn’t let us down. 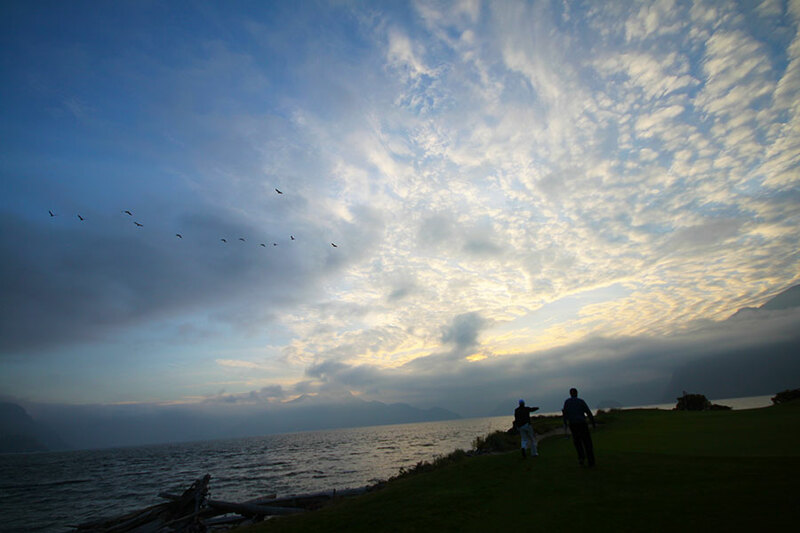 Known by many as the place where scenes from the movie ‘Happy Gilmore’ were shot, its scenic beauty enchants more than any online image possibly can. I’ve played some hilly courses but this one takes the biscuit. 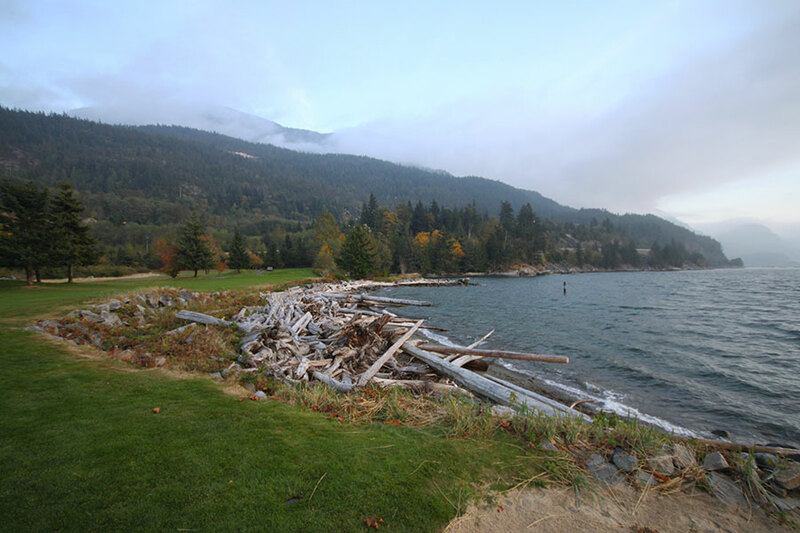 Built on the side of a mountain forest overlooking Howe Sound, its signature hole, the 14th juts out into the water, Pebble Beach-style. There’s no way any sane golfer would choose to walk this course so golf carts with intermittent, partially dysfunctional GPS devices are supplied as a matter of course. Some of the golf shots one is presented with have more vertical distance than horizontal and the first tee shot has a 150ft drop to a postage stamp fairway and green with water left and general forestry nonsense to the right. View back from the 14th green.. The round was great fun and we only just managed to get to the clubhouse before complete darkness. 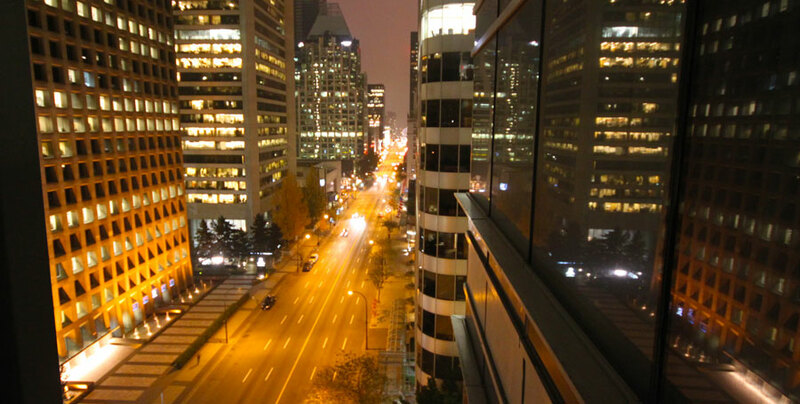 Gordon kindly delivered us back to our respective hotels and a band dinner at CinCin’s restaurant on Robson Street was our second visit there in as many tours. Day-Off Wine of the Day – Today’s delicious day-off drop is a 2008 Cedar Creek Syrah from a vineyard near Kelowna BC. This wine won Canada’s Red Wine of the Year award in 2007. On our travels across this great continent, we’ve come to appreciate some fine local wines and this little beauty doesn’t disappoint. At around $25 a bottle, it’s a worthy tipple of any dinner party, bus or post-concert session. With a bouquet of blackberry and white pepper and a taste of vanilla and plums, this sun-loving Syrah has a long juicy finish. Interestingly, the folks at Cedar Creek pair this wine with Scrabble. Show Day – Post-golf sleep is always deep and I woke to the sound of raindrops hitting the glass exterior of the high-rise tower. Breakfast downstairs was first on the agenda and Mark, Glenn, Paul, Pete and Ian were already tucking into the finest the Shangri-La could offer. Predictably I ordered Orange juice, Coffee, fresh fruit and Bircher Muesli. The service was ultra-slow, especially when you consider there were only two other guests in the dining room. The Rogers Arena in Vancouver is huge. This must be the most cavernous venue of the tour so far and Saen’s bus pulled up at the backstage door at 5PM, in time for a few of us to take a long trek towards catering and some very interesting peanut and pumpkin soup. Leftovers from lunchtime are left out as long as possible to cater for ‘stragglers’ such as ourselves. Very nice of them it is too. Catering was situated behind the stage but in what is normally a public area up on level 1 and just along the vast corridor was a fabulous Vancouver Canucks sculpture. 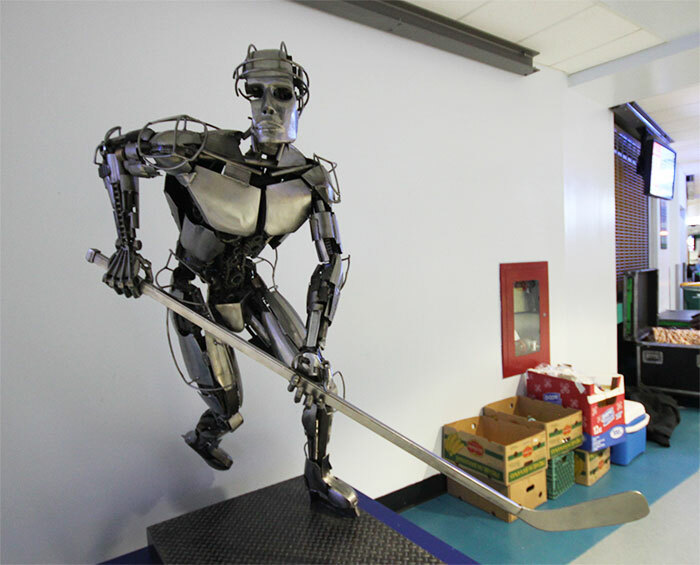 Standing more than 6-feet tall and weighing roughly 450 pounds (including the base), the sculpture entitled ‘Hockey Player’ was created by 38 year-old Cory Fuhr from a sketch from more than 800 pieces of steel, 100 in the face alone, it comes apart into two pieces for “easy” transport and took eight painstaking months to build. With the internet being what it is, a minefield of useless information, I learned that Mr. Fuhr comes from an organic onion growing background. So to the gig…another fantastic 73 minutes whistled by and the Vanouverians (or is it Vancouverites?) didn’t disappoint with their reaction and enthusiasm. The standing ovation lasted as long as it took us to walk the 500 or so yards back to our dressing room. Half an hour later, Bob took to the stage and since our dressing room was way at the back of the hall, it was only a few yards to a door through which we could see his set. A few of us watched a couple of numbers before we were ushered aboard our trusty bus once more, this time bound for the airport and a very short hop down to Seattle and back onto American soil. We were delighted to be greeted at the plane by Diane, a stewardess who looked after us so expertly back on the 2010 Get Lucky tour. Diane served up shepherds pie for those who were still hungry after-show…which was most of us. I summoned up all available will-power and abstained. After a relatively speedy immigration check and fingerprint and photographic screening nonsense we were allowed back into the U.S. 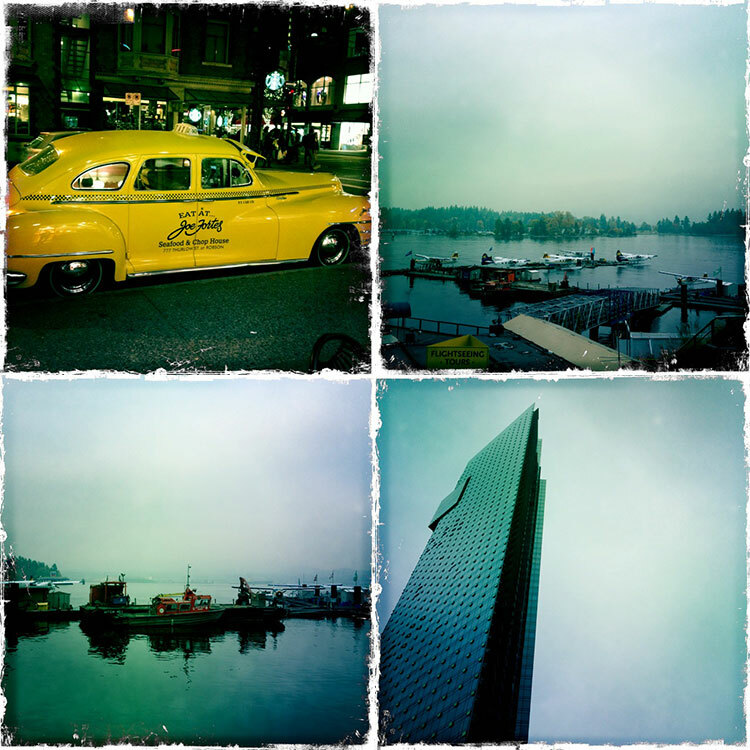 The plane then taxi’d back to where Jason’s bus was ready and waiting to whisk us on to another of our favourite tour hotels on the Seattle waterfront.